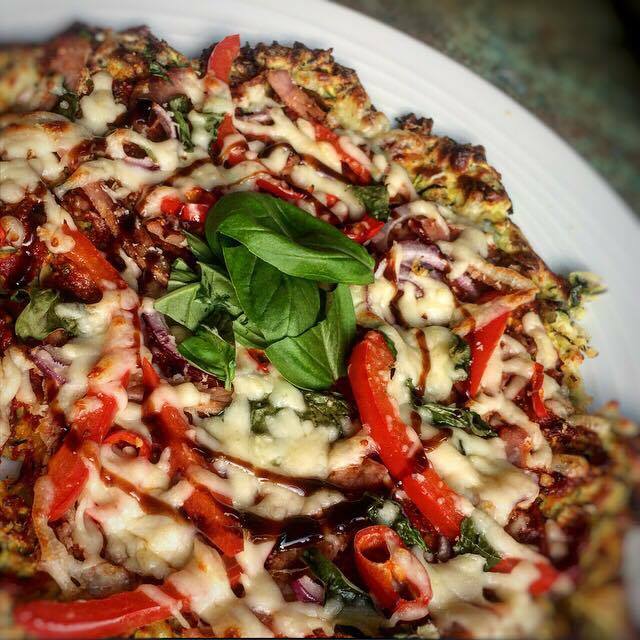 Given the popularity of the classic low carb cauliflower base pizza alongside my love for all things courgette, I decided to try and covert my regular cauliflower pizza recipe into a courgette based pizza. The challenge was easier said than done but, after a few tries, I am happy to report I have finally perfected it. The texture is a little less firm that the cauliflower version however the taste is even better. I served this with a large side salad to keep it nice and fresh. There are several key things which you mustn’t skip to make this perfect. Number one, don’t forget to squeeze the water out of the courgette, if you don’t do this step your base will not cook and it will turn to mush. Number 2, make sure you cook the base on a preheated totally flat baking tray sprayed with 1kal. If you have any lumps or bumps, you risk the base sticking to the tray. Thirdly, don’t be tempted to cook this on a sheet of baking paper. The base needs the heat from the baking tray itself to cook through so preheating it helps with this. Feel free to change the toppings to any you prefer. Just remember to pop the recipe back through the recipe builder to recalculate the smart points. Preheat the oven to 200c. Pop two non stick baking trays into the oven to warm up. The baking trays need to be of the flat kind (no bobbles or rivets) so that the pizza slides of the tray at the end. Grate the courgettes into a large bowl, sprinkle over a pinch of salt and leave for 10 minutes. After 10 minutes squeeze out all of the water using a clean tea towel. Return to the bowl and add the beaten eggs, flour, parmesan, 70g of the mozzarella, oregano, basil and garlic salt. Combine well. Take the baking trays out the oven and spray with low calorie cooking spray.DO NOT use baking paper or tin foil as the base of the pizza won’t cook. Add half the base mixture to each tray and shape into round pizza shapes (approx. 9 inch circle), around 3-4mm thick. You don’t want the base too thick or it will end up soggy. Pop in the oven for 15-20 minutes until the base turns a nice golden brown colour. Remove the base from the oven and spread the pesto and tomato puree across the top. Evenly distribute the onion and pepper over the top and and then sprinkle over the bacon, crushed chillies, basil and remaining mozzarella. Put the pizzas back in the oven for 5-6 minutes until the cheese starts to melt and bubble. Remove from the oven, slice into 6 and then serve on a large wooden board with a nice rocket salad in the centre. Drizzle with balsamic vinegar to finish.